Floor registers in Victorian styling add beauty to homes new or old. 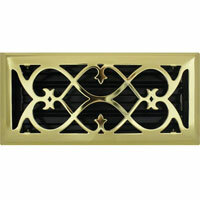 The brass plated floor register cover comes with an adjustable damper for ease of air flow control. 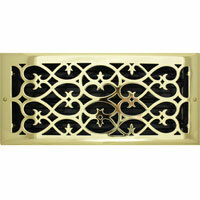 These beautiful and functional Victorian brass plated floor registers will bring a touch of elegance to any room. We offer a variety of sizes to suit most size needs. These Victorian style floor registers offer a brass plated finish that features a protective top coat to protect it from rust. The construction is all steel including the adjustable damper to control air flow. 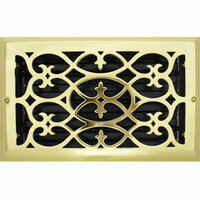 Decorative heat register covers that are as functional as they are beautiful. These 4 x 10 floor air vents offer a steel core and an adjustable metal damper. What's not to like about this finely crafted 4 x 12 inch Victorian Brass Plated Register? Gorgeous brass plated finish, striking design, steel core, fully adjustable metal damper, and easy drop-in installation. Order today! 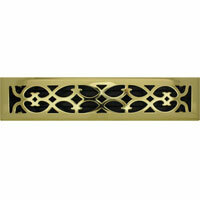 Beautifully crafted antique brass floor registers to add sophistication at an affordable cost. Made with 3mm thick steel plating and steel damper to control airflow. Purchase today! Floor registers in Victorian styling add beauty to homes new or old. 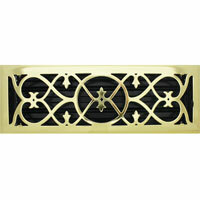 The brass plated floor register cover comes with an adjustable damper for ease of air flow control. These sturdy register covers will give your floor a finished look at an affordable price. 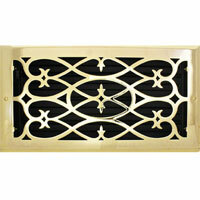 These beautiful Victorian style floor and wall registers are a great design statement in any home or office. They feature all steel construction and an adjustable damper. Our largest Victorian Brass Plated floor vent is offered in this 6 x 14 size. 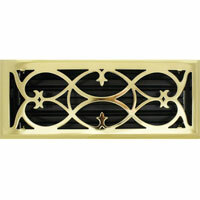 Knock out screw holes on the vent allow for wall or ceiling mounting. 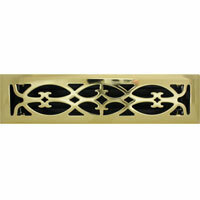 Made from 3mm steel, these decorative air grilles are durable enough for foot traffic.